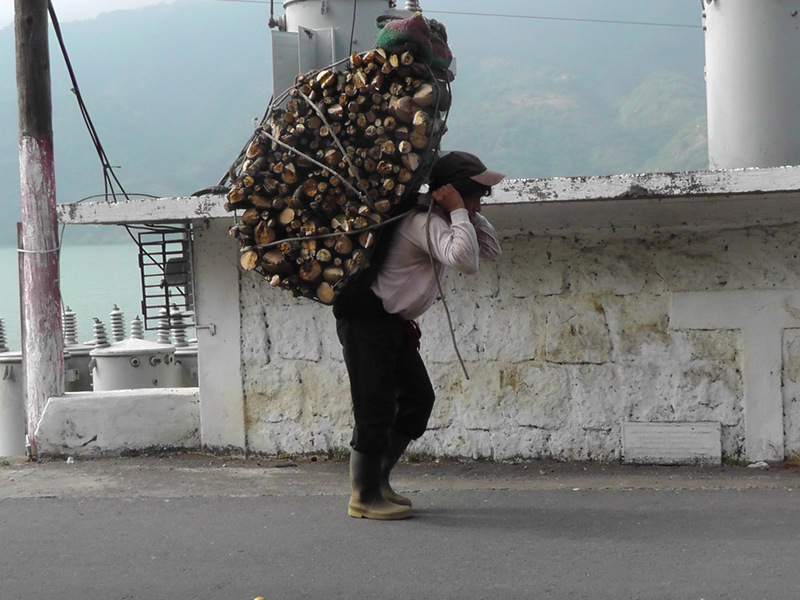 Lago de Atitlán | Where's my backpack? 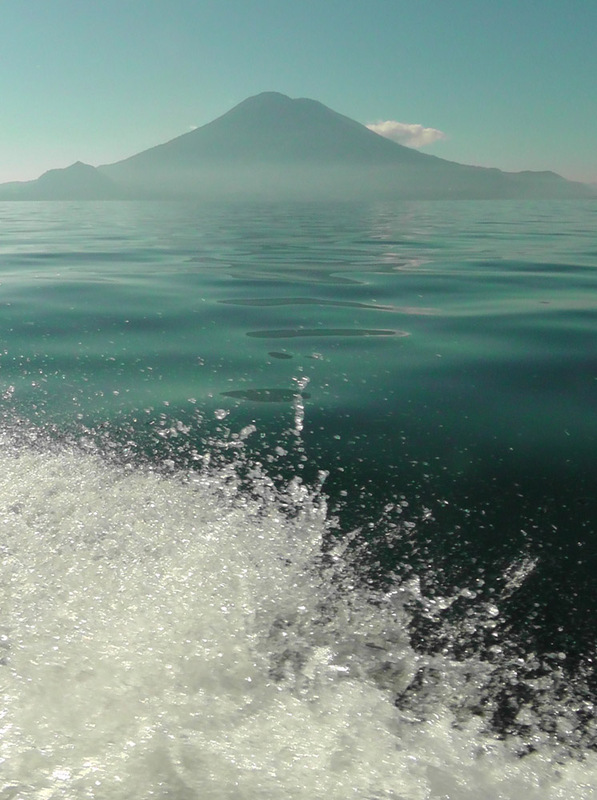 Vacillating between emerald green and azure blue, surrounded by a ring of majestic volcanoes, smooth as glass until the 4pm Xocomil wind whips up colossal waves; Lake Atitlán is impossibly beautiful. 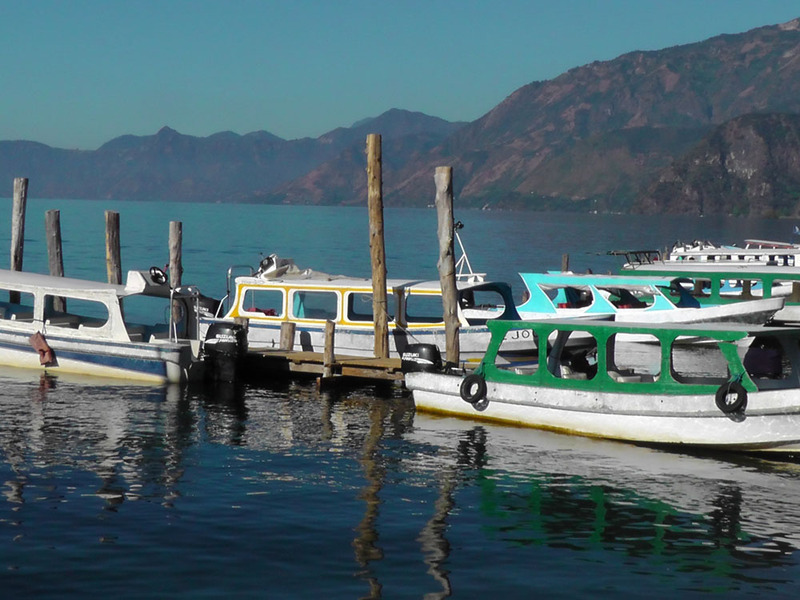 It was very close to the top of my list of places to see in Guatemala; I was so determined to see this place for myself that I got on a shuttle bus in Antigua at the unearthly hour of 5am (I am not naturally an early riser) and set off for the shores of Lago de Atitlán. Rubbish quality, but should give you an idea of the amazing mist-filled valleys and the bumpy ride. 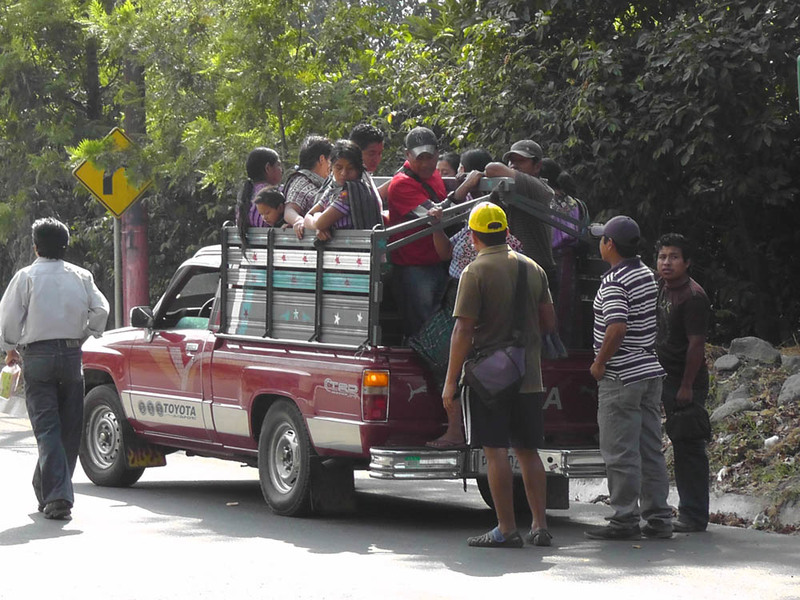 At some point the shuttle stopped and most of the others got out to transfer to a bus heading for Mexico, leaving just a few of us to continue the journey to Panajachel with lots of room to spread out. And then we saw it. 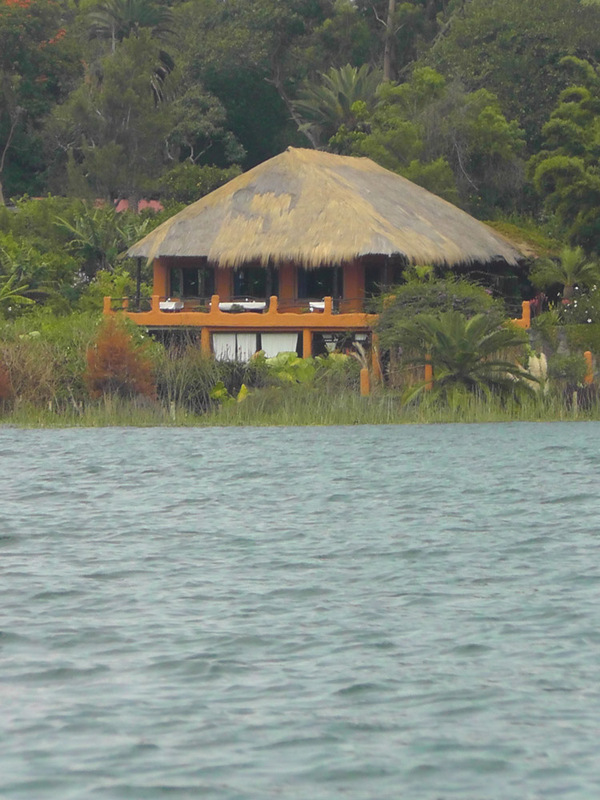 Our very first view of Lake Atitlán. We collectively caught our breath and Freddy picked up on it – he pulled the shuttle over to the layby so we could get out and stare in wonder at our destination. Daylight was in full swing at this point, and so was Freddy – turns out he had a penchant for the Black-Eyed Peas, so we rocked into Panajachel with the volume up full blast listening to Fergie and Co. banging out “I’ve Got a Feeling” – best arrival in any town anywhere, ever. Thanks Freddy, not something I am likely to forget! 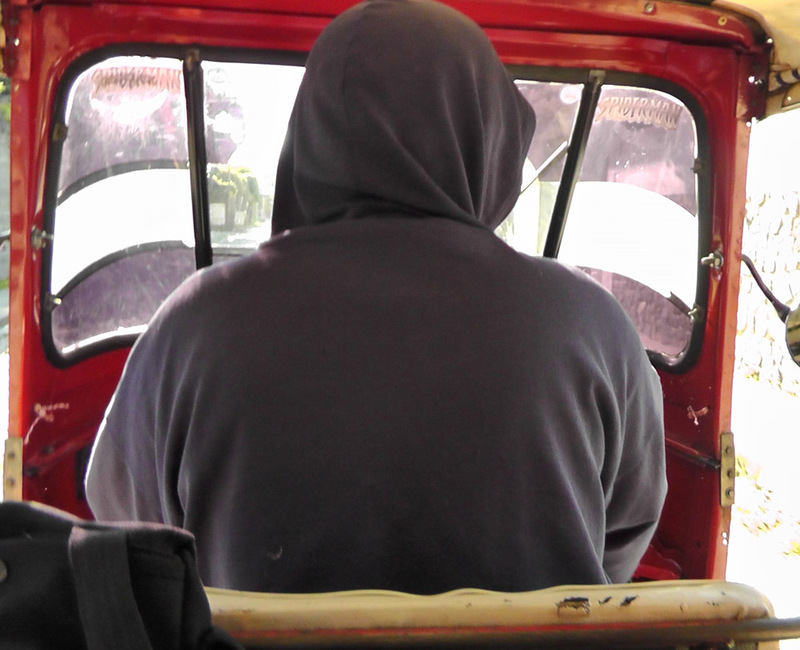 I was dropped off in the centre of town and whisked down to the dock by a guy called Julius in a tuk-tuk – I LOVE tuk-tuks, I think of them as souped up golf carts with personality – you can’t help but be cheerful when you’re in the back of a tuk-tuk zipping through the traffic. At the dock, Julius pointed out where the boat would come in and waved goodbye as he shot off in his tuk-tuk in search of the next fare. 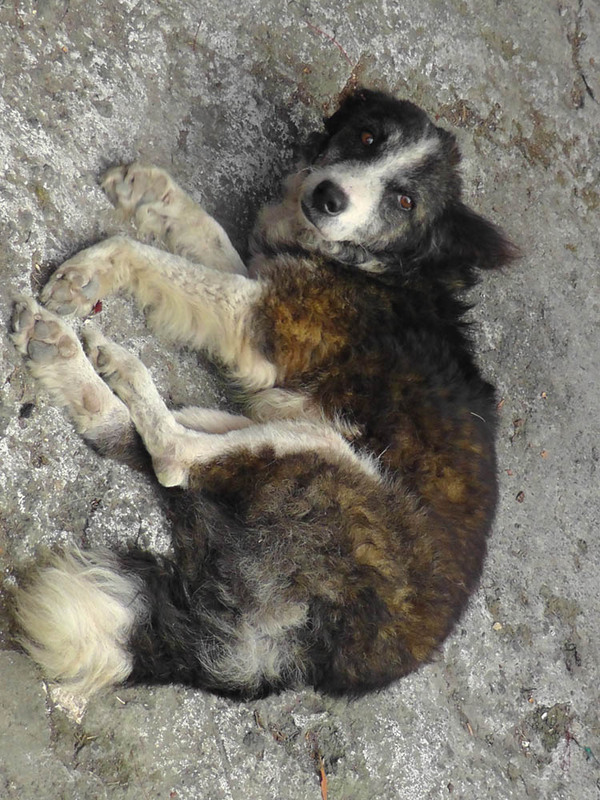 Waiting by the dock in the early morning sun, one of the many, many stray dogs came up and made friends – he stole my heart with his sweet little face and lop-sided ears – in my mind I named him Loppy because of those ears. 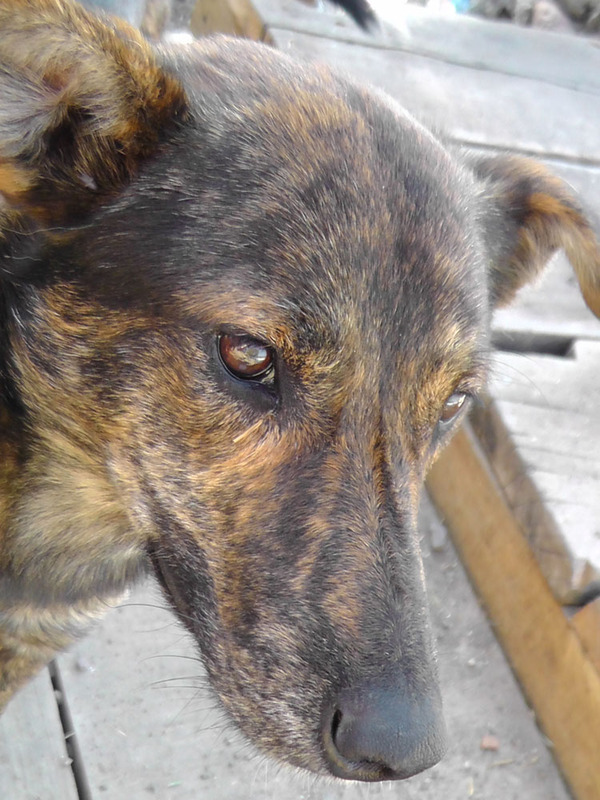 He was such good company that when the boat was ready to board it was hard to say goodbye – he walked right up beside the boat and watched as we pulled away from the dock. I imagined jumping overboard and swimming back to him, somehow smuggling him home with me, but I sat still and watched as the dock receded into the distance and Loppy wandered off in search of a new friend. I hope he found one. 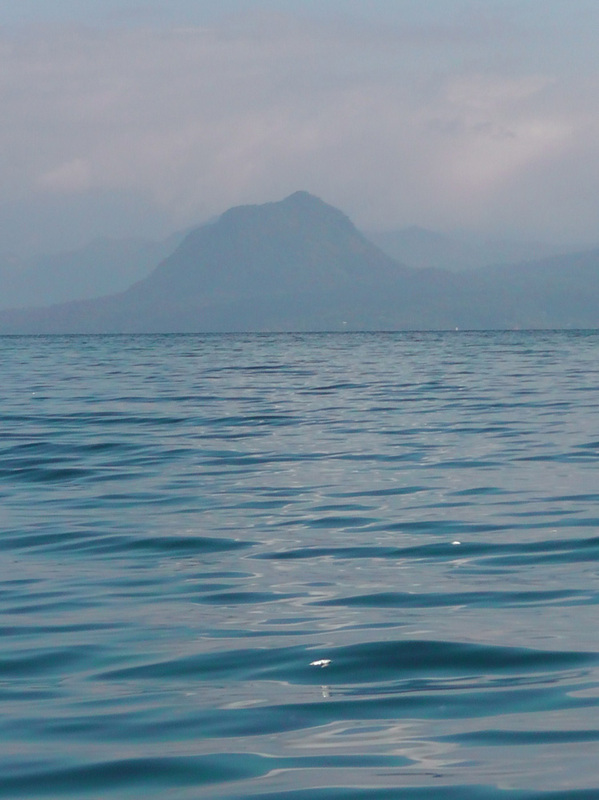 As the boat glided across the water, I turned away from the Panajachel dock and gasped audibly at the sight of that crystal clear water with an almost silken surface, and the monumental volcanoes of Atitlán and Tolimán towering ahead of us. 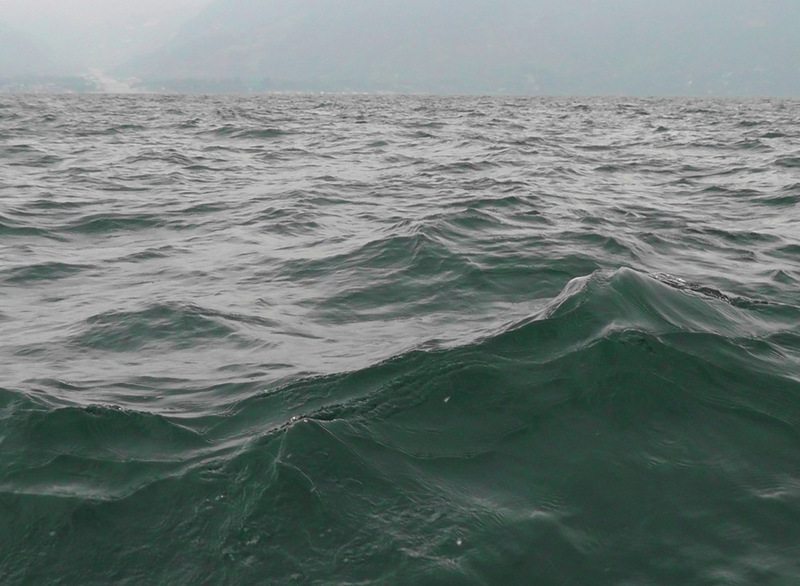 I was clicking feverishly, couldn’t stop taking photos, when the boat bobbed and I accidentally caught some of the boat’s wake in the bottom of my shot. Now I was transfixed, each spray seemed more perfect than the last. A couple of hundred photos later we pulled into San Marcos where two sweet little local boys, John and Darwin, both aged 12, showed us around the little town with perfect English and perfect manners. San Marcos is tiny, but it has a lot of heart. There’s a very basic but clearly loved and frequented church in the middle of a clearing, winding pathways flanked by lush foliage and a little open air stage where concerts and festivals are held, and where John and Darwin showed me their breakdance moves and confessed they liked Justin Bieber. 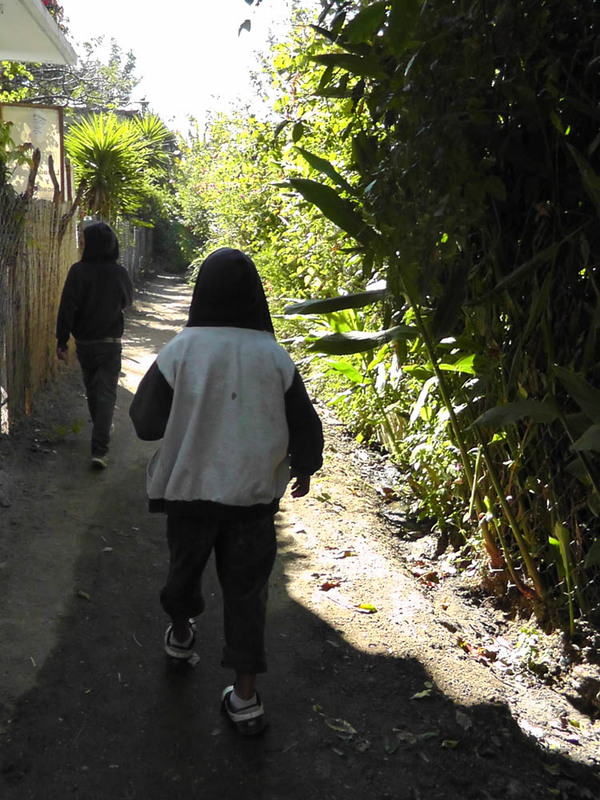 Darwin and John lead the way along the winding lanes of San Marcos. Back down at the dock, our boat driver Benjamin readied the boat as we waited, taking in the stunning view before us. 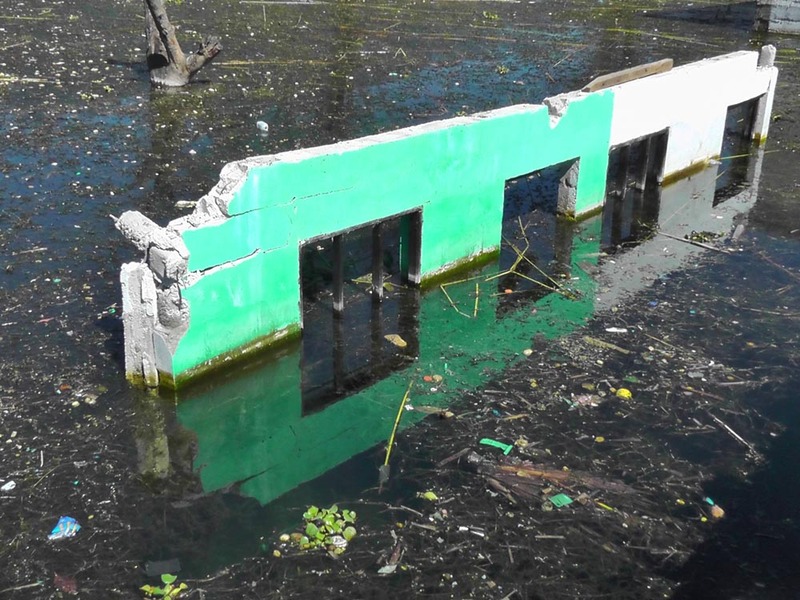 Looking around as I was waiting, I noticed some buildings almost completely submerged in the water. There was no one around to ask what is going on, but I stuck it in the back of my mind to return to later. 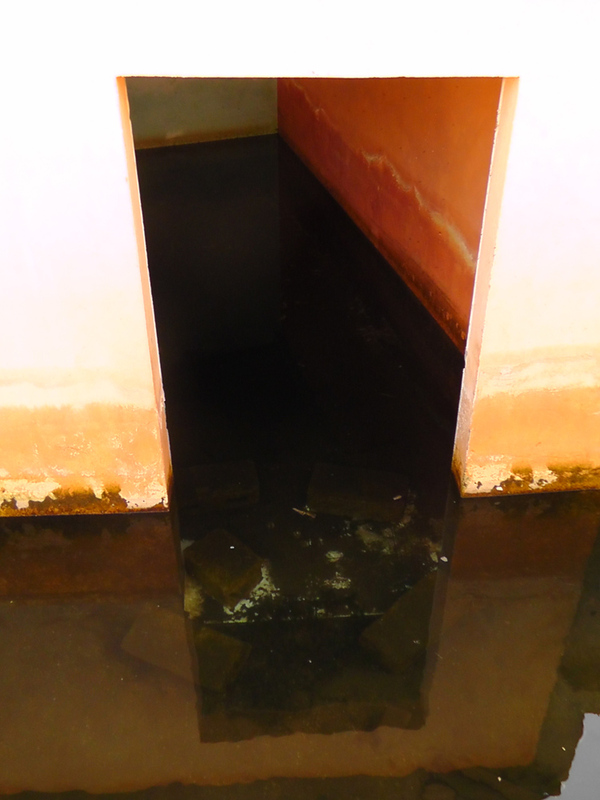 Just the top of the building showing above the water. Benjamin brings in the boat to pick us up at San Marcos. 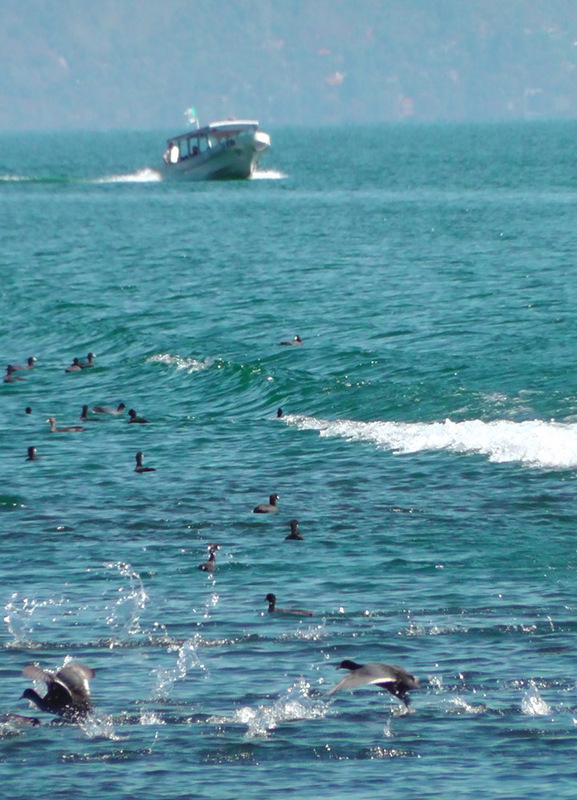 Birds scurrying out of the way of our boat as we approach them. Wake of the boat and patchwork hills. 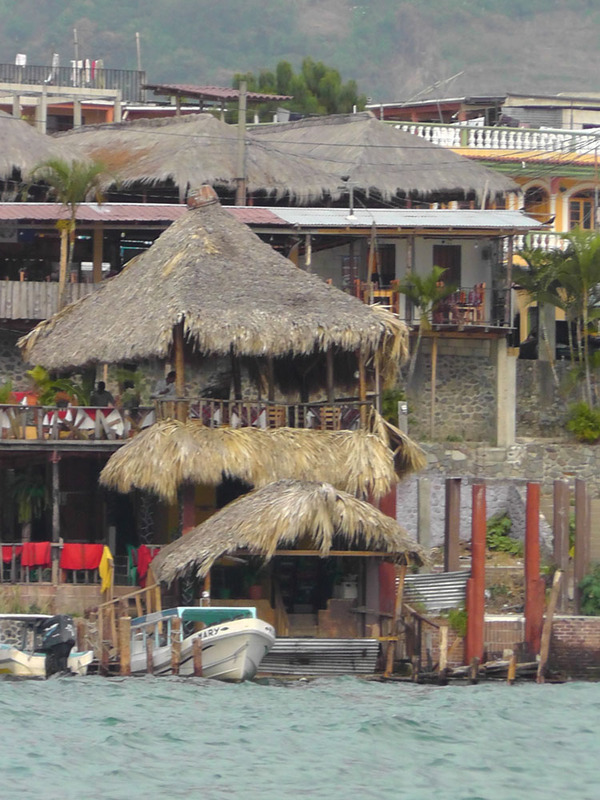 Now it was off to San Juan and time to grab something to eat at a lakeside restaurant. 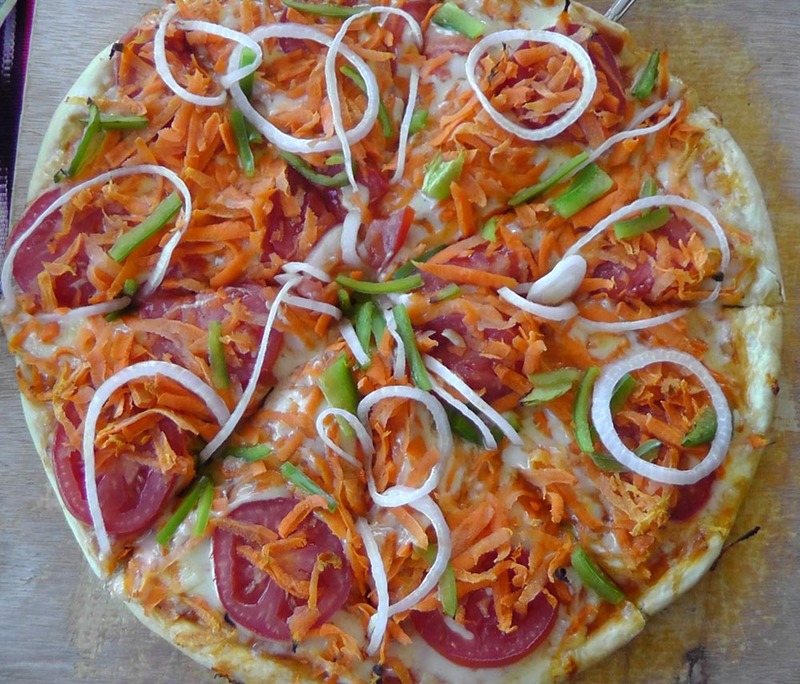 I ordered a vegetable pizza and when it came out it turned out to be a carrot pizza. Best pizza ever, I couldn’t believe how tasty it was. I want carrot on all my pizzas from here on out. I am a convert, carrot pizza is delicious. Back down at the shore, I saw many more buildings half submerged and now I needed to know what the story was. 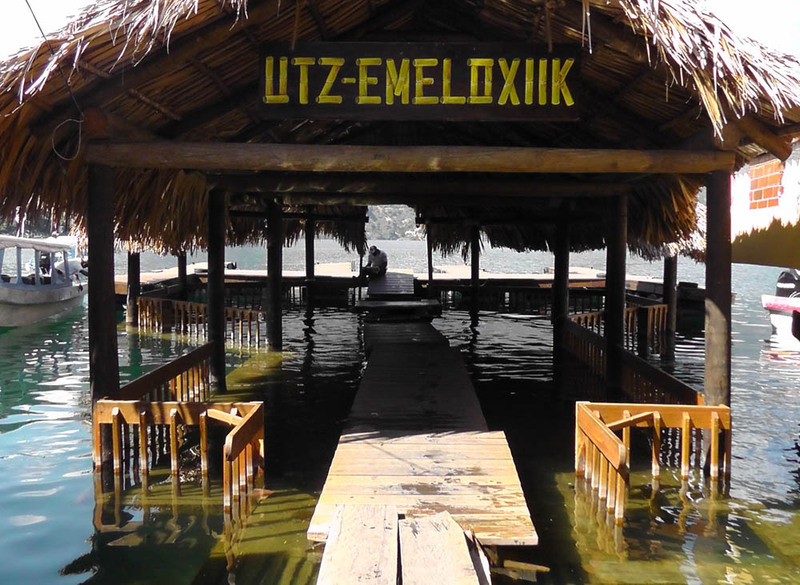 A nearby tour guide explained that Guatemala has received an unprecedented amount of rain over the last year, and the only outlet for Lake Atitlán is blocked, so all that water has nowhere to go. 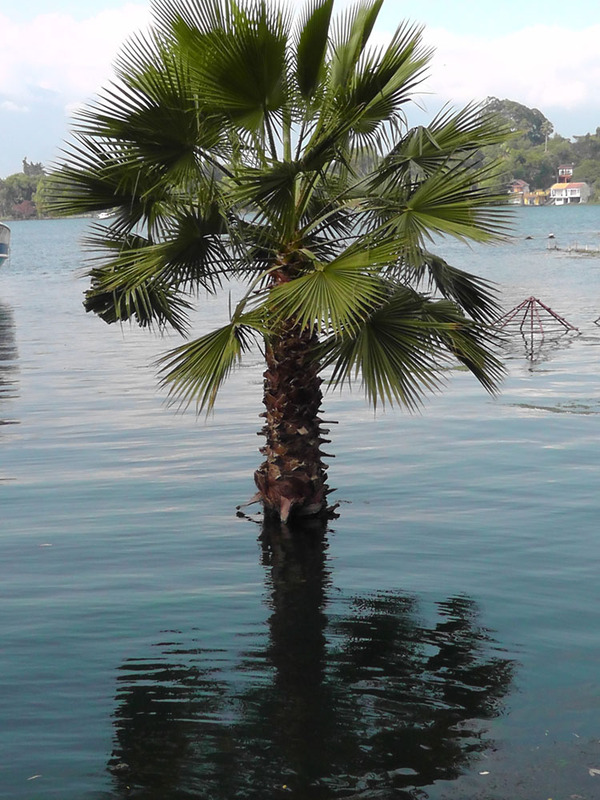 The level of the lake has risen over 7 feet in the last year, engulfing anything along the shoreline. 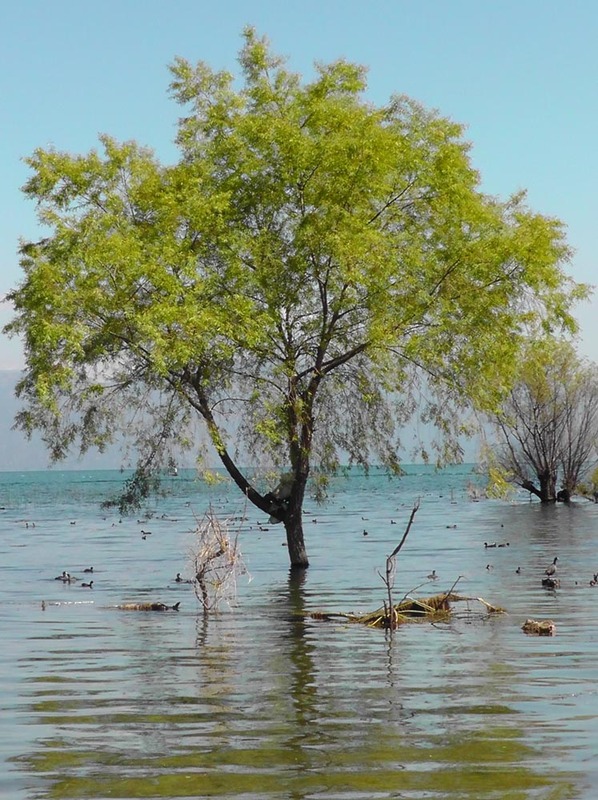 Trees all out at sea. This was dry land last year. 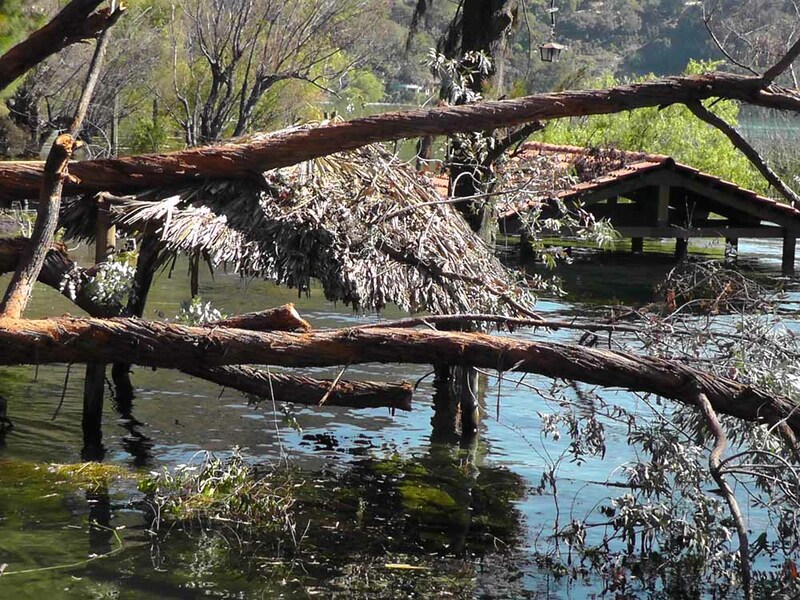 Boards lead the way to the boats – the original dock is several feet underwater. San Pedro is laid back, has a nice feel to it. It was my favourite of the villages I visited around the lake. There are winding lanes that take you through fields of coffee down to the shore and the layout and vibe of the place reminded me a lot of the Greek Islands – in the off season – I find the Greek Islands at the height of the busy season to be terribly stressful. 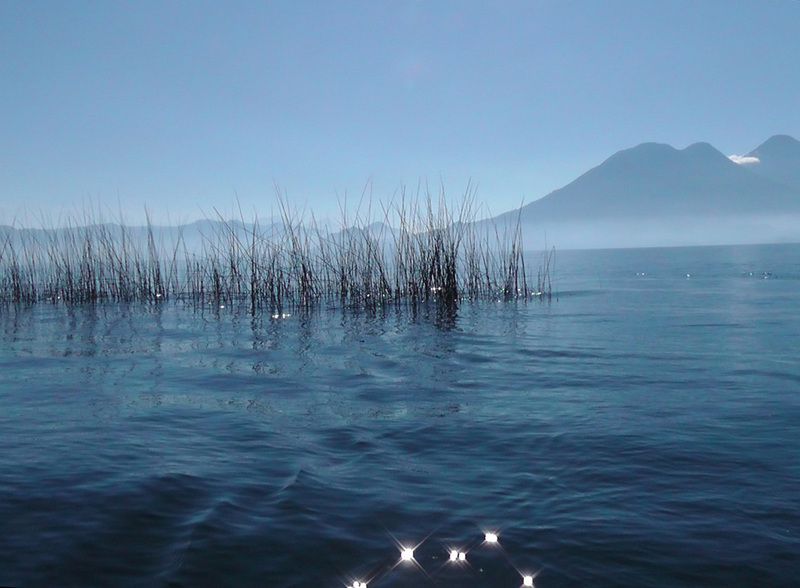 Back in the boat, the lake was still stunning, and a mist was beginning to roll in over the volcanoes. Next stop was Santiago. Santiago was the biggest of the villages I visited, and in order to get a quick overview of the place, tuk-tuk was the order of the day. I love tuk-tuks. Jacob navigates around Santiago. Tour guide and tuk-tuk driver Jacob stopped at Parque del la Paz and told the story of the horrific massacre that took place here in 1990 when the Guatemalan army opened fire on villagers. To this day, the Guatemalan army is not allowed to have a presence in Santiago. 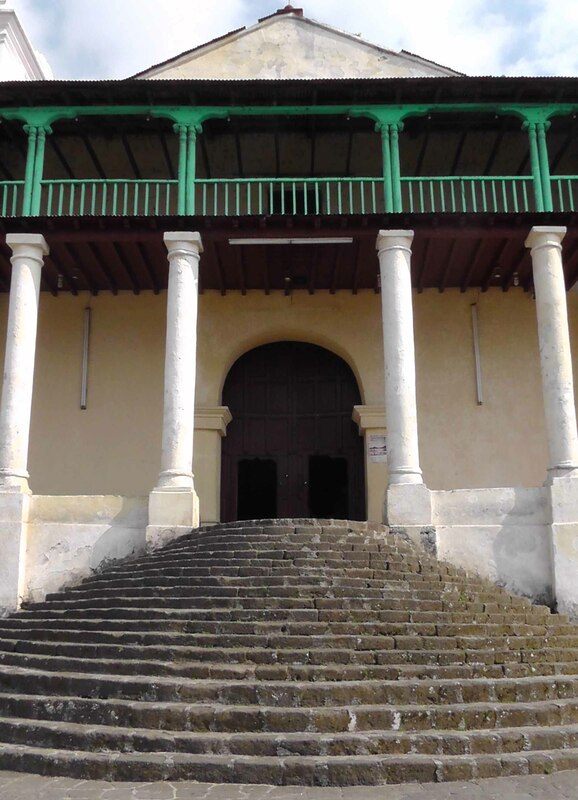 We visited the Santiago Church which is located in a very odd, desolated sandy courtyard. 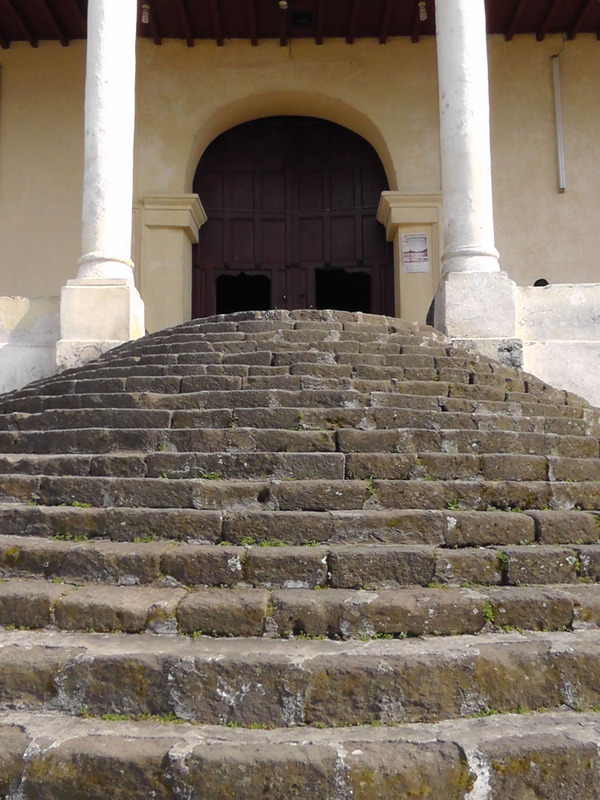 The area and the church had an uneasy feel to it, and it turns out that during the 80’s four men entered this church and murdered the priest. There was a flower-strewn alter for him inside. I was quite happy to leave this place post haste. Those steps are steeper than they look. We talked about the Tz’utjihil language and the traditional religious practices of the Mayans, with Jacob explaining that instead of having a fixed place of worship like a church, the Mayans worship in a private home, and that home changes each year. He offered to bring me to the current place of worship if I’d be interested. Of course I was. 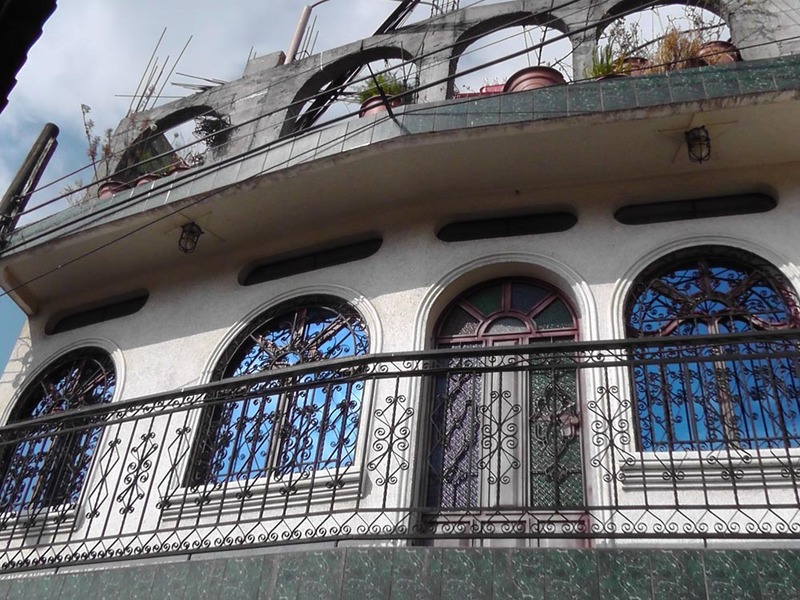 So we tuk-tuked along the streets to stop in front of a house with some rather ornate windows. 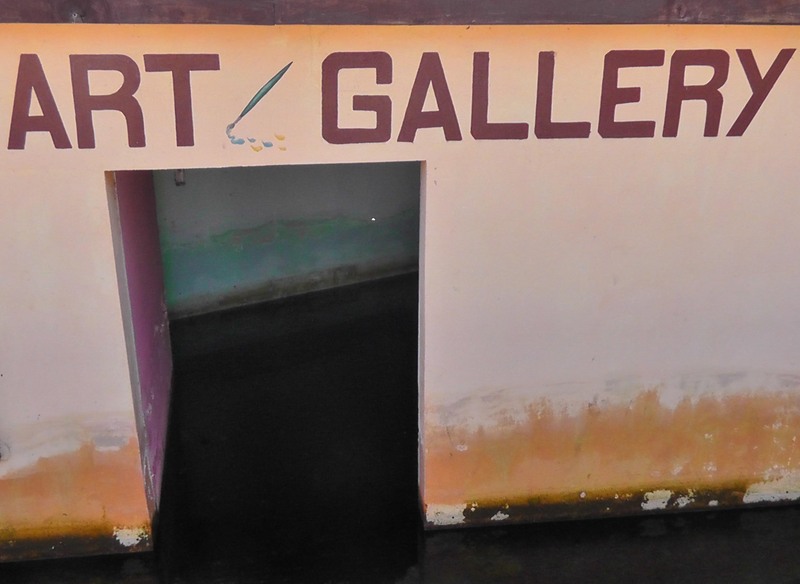 This, however, was not where the place of worship was. Jacob got out of the tuk-tuk and led the way through an alley barely wide enough for one person, past backyards with chickens scratching around, open doors to houses, right to the very end of this alley, where a tiny little cement house stood with its doors wide open. Thick pungent clouds of incense filled the room, dozens of candles threw eerie shadows on the walls and from the rafters was hung every sort of lantern imaginable. To the right was a glass case housing what looked like a dark-skinned Jesus and there, in the middle of the room, stood Maximón, a strange mix of pre-Columbian Mayan and Christianity. He is not a benevolent deity, and needs to be placated with offerings of money, alcohol and cigarettes. 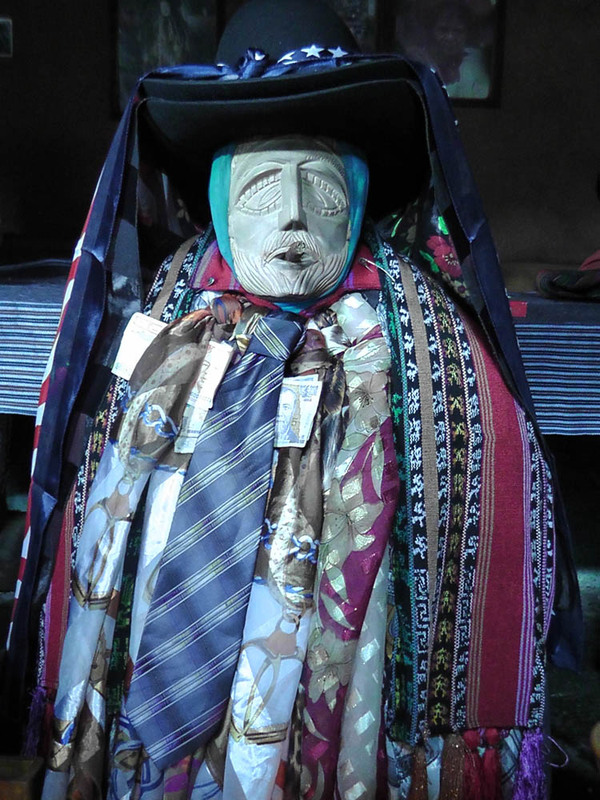 Maximón had an unlit cigar in his mouth and there was an opening where his attendants could pour in alcohol. Any god who drinks and smokes is alright by me. There were several people in attendance, an elderly gentleman sitting by the door, a young boy over to the right, and a silent middle-aged man in the left corner at the back of the room. He was introduced as the shaman and we shook hands. I asked a few questions and just hung out there for a little bit, absorbing the atmosphere – I was getting drawn in by the heady scent of the incense and the dancing shadows on the walls. One of the more unusual things about the whole setup was this odd high pitched noise that permeated the room – Jacob said it was something to do with the Christmas season but I didn’t understand fully what the significance was and the sound was disorienting, mesmerising. I asked Jacob how to say goodbye in Tz’utjihil and parroted the word he gave me. The shaman came forward and shook my hand, and said something which Jacob translated as ‘It was an honour to meet you. Thank you for visiting us.’ Then it was off back down the alley and into the tuk-tuk to get back to the dock. I can still smell that incense. 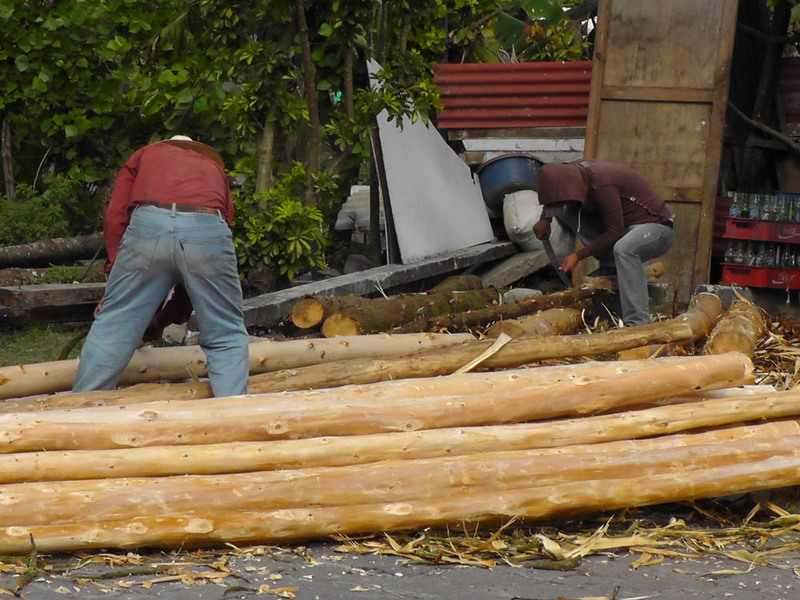 On the way back to the dock, I noticed some loggers hard at work stripping tree trunks with machetes. They worked in silence, with impressive efficiency. I had to admire their skill; they made it look effortless. This is after half the passengers got off. I will never complain about hauling laundry up 5 flights ever again. Benjamin was waiting and once aboard, he got the boat ready in record time. You got the sense he was on a schedule. 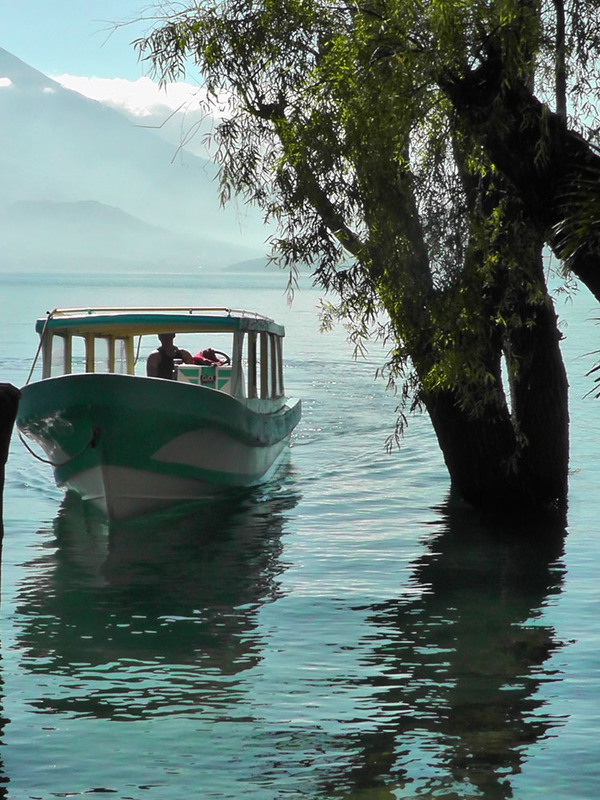 The schedule, presumably, was to get back to Panajachel before the Xocomil hit and the placid lake turned into a maelstrom. 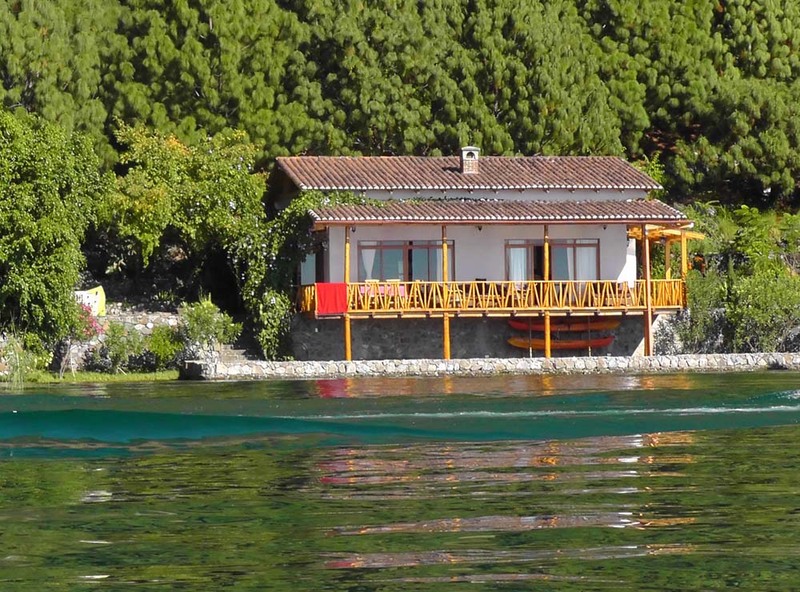 As we sailed away from Santiago, we steered along the most beautiful pathway of water that snaked through the surrounding reeds and past some impressive houses. Now Benjamin was on a mission, revving the engines as the wind started to pick up. Seriously choppy, hope you have your sea legs! Boy, that Xocomil knows how to get a party started. 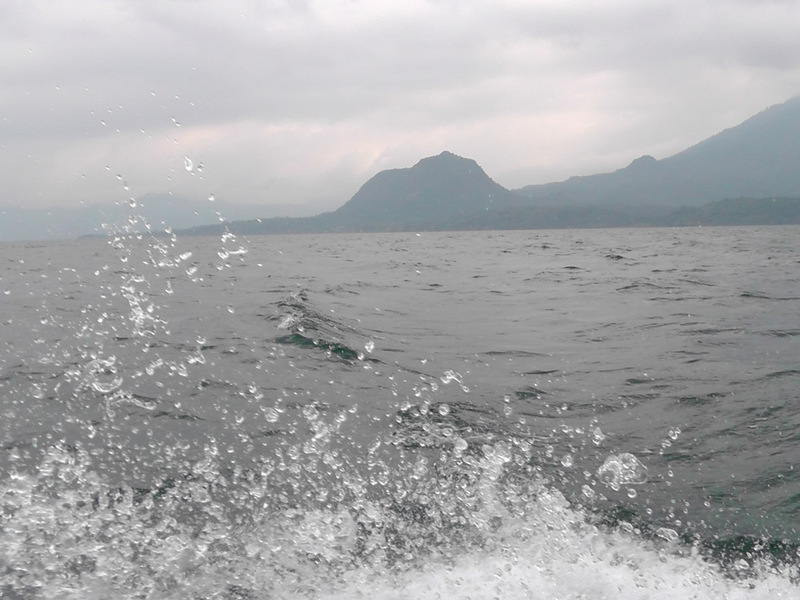 By the time we made it across the lake and were nearing Panajachel, the boat was being battered by monstrous waves, swaying precariously from side to side and catching air when riding the crests of the bigger waves. I have heard that often, the winds and currents conspire to create an actual water spout rising up out of the lake, but I didn’t get to see it that day. 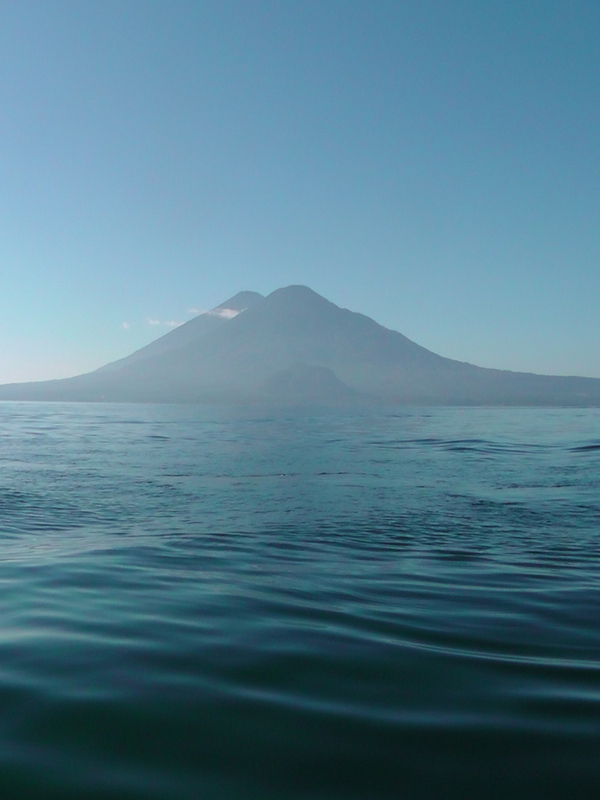 It was quite a relief to finally catch sight of Panajachel. 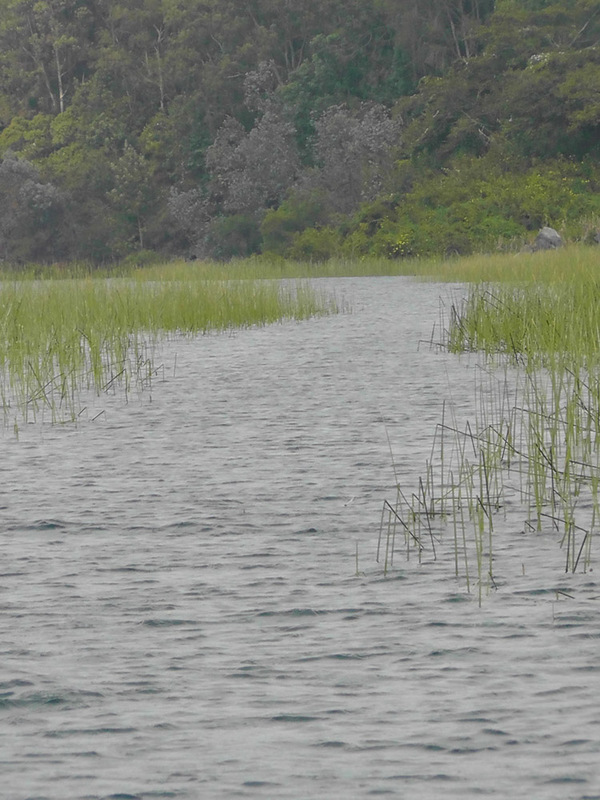 Made it back to Panajachel before Xocomil sank our boat. Loppy was nowhere to be seen, so I couldn’t say goodbye. It was back in the shuttle for the two and a half hour ride back to Antigua. 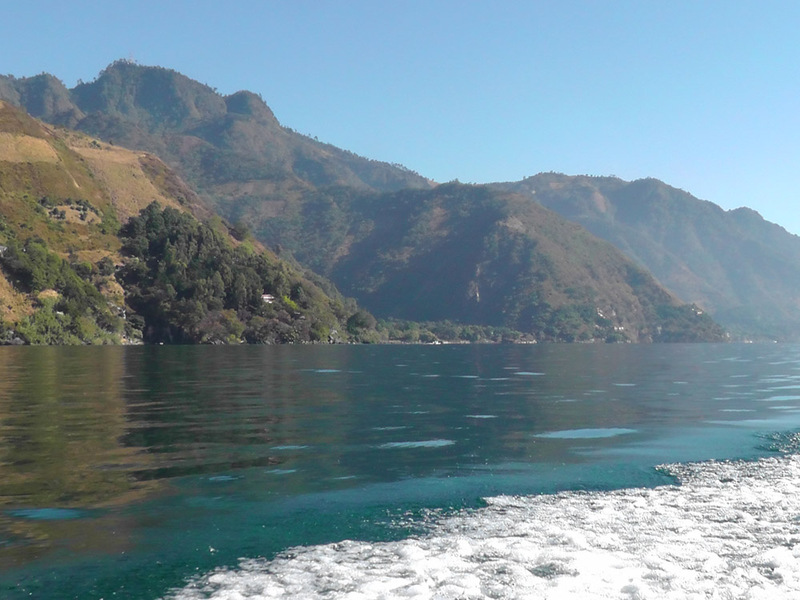 Thankfully the shuttle was almost empty so there was plenty of room to stretch out and dream about the next time I return to the magical Lago de Atitlán. 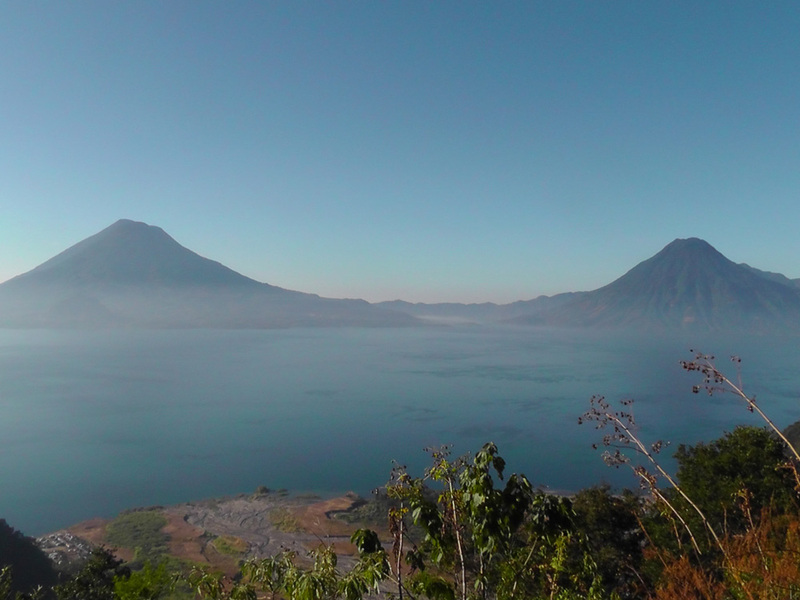 For more about Guatemala, check out Life on Lake Atitlán, Tikaaaal!, Climbing Volcán de Pacaya, Coffee Farms and Burning Devils and La Antigua. Wow, is this absolutely beautiful! Oh and I was so close too! But I only had a week and was studying Spanish and volunteering. NEXT TIME!!!!! What a beautiful place – almost dreamlike! Thanks Daniel – awesome bucket list you have going there! Add Guatemala to it, it is the most amazing country I’ve visited. There are so many amazing places all around the world, that I just want to see it all.